Protecting Tradition｜Sustainability｜DAITO KASEI KOGYO CO., LTD. 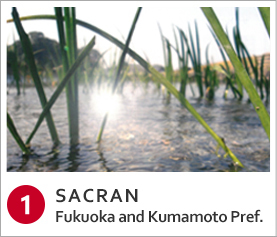 There is a freshwater species of algae known as Aphanothece sacrum that grows in parts of Kyushu. From this alga, a polysaccharide called Sacran can be extracted that carries exceptional water retention properties and offers a moisturizing effect for cosmetics, making it a valuable natural material. We know that Aphanothece sacrum requires pure and clean streams rich in natural minerals for growth. But in recent years due to river construction projects and similar work, the pure water required to nurture this natural alga has been decreasing, and Aphanothece sacrum has become extremely rare. 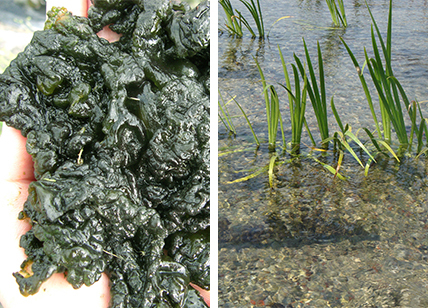 Today, thanks to many people’s great efforts, cultivation of this alga is underway in the beautiful waters and splendid natural environments of Fukuoka and Kumamoto prefectures, resulting in a stable supply of this material. By using Aphanothece sacrum and the Sacran it produces, we hope to make people aware of the existence of this valuable plant and the current situation it faces. And by adding life to these cultivation operations, we aim to help maintain and nurture the beautiful natural environments in which it originally existed. 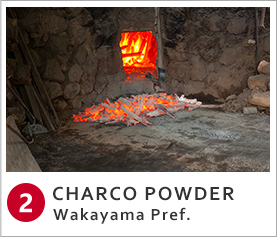 Charco Powder is a cosmetic powder made using only Binchotan charcoal produced in Wakayama prefecture. The charcoal is made from Quercus phillyraeoides that grows naturally in the area between mountain foothills and arable flat land (Satoyama) in Minabe and Tanabe cities in Wakayama prefecture. 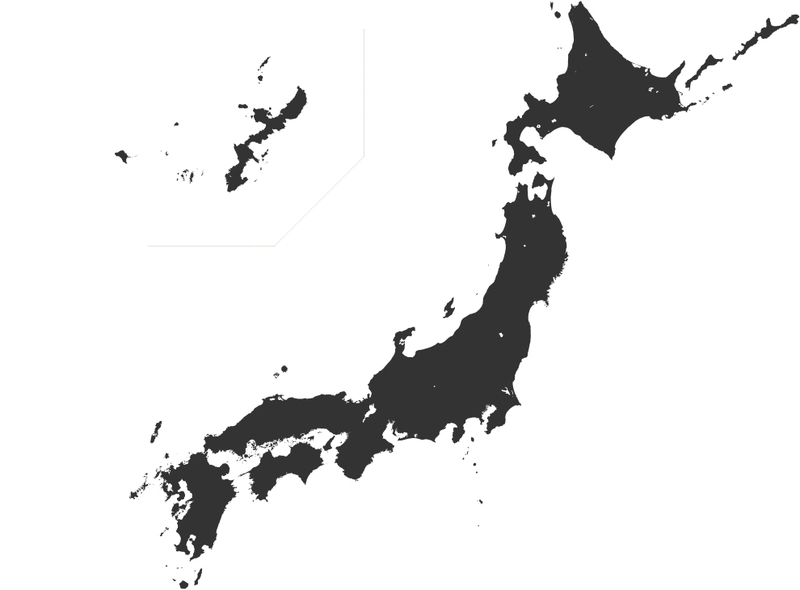 In 2015, these regions were registered as a world agricultural heritage site under the name ‘Minabe-Tanabe Ume System’. While lacking in nutrients and vulnerable to landslides, the slopes here have been affectively utilized to achieve sustainable agriculture, and the Quercus phillyraeoides which are grown for fuel and make up the raw material in Charco Powder help support this system. To continue protecting this natural Quercus phillyraeoides, a traditional cyclical felling method called ‘selective cutting’ is used where only plants of a prescribed trunk thickness are subject to felling. By protecting unprocessed timber this way, we help prevent landslides and related disasters in the area. 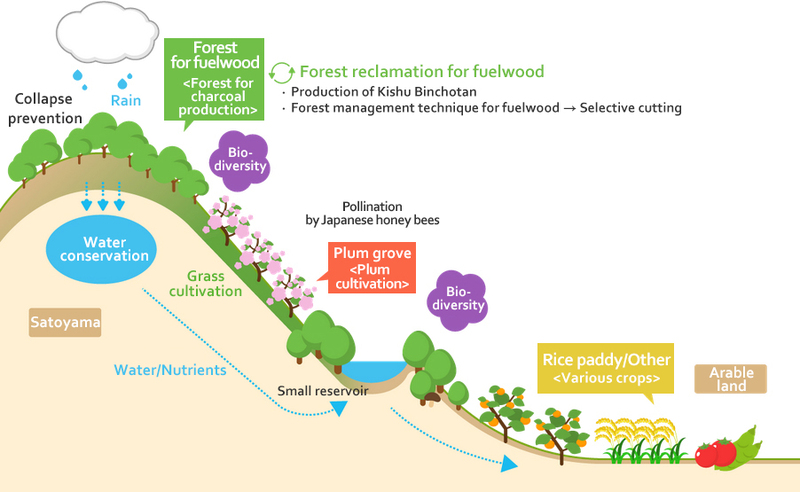 The practice also contributes to protecting another large traditional Wakayama plum cultivating operation taking place at the foot of a mountain here. Visit the Minabe-Tanabe Ume System homepage for further details.